It’s amazing how kids love to stick things together, and how many craft projects just wouldn’t be possible without glue. Glue can be, and is, made out a wide range of materials including cassein (milk protein) and animal hides. But for the most part nowadays, if you have glue around the house, called anything like “craft glue”, “wood glue”, “school glue”, “project glue”, “white glue” or “carpenter’s glue”, chances are it is made of PVA (polyvinyl acetate). Polyvinyl acetate is not the worst offender when it comes to toxicity and environmentally dangerous ingredients, and is mostly a hazard for the people who have to work manufacturing it. However, it is a highly synthetic substance that I wouldn’t recommend eating. It does not occur naturally in the environment and is toxic to aquatic organisms. 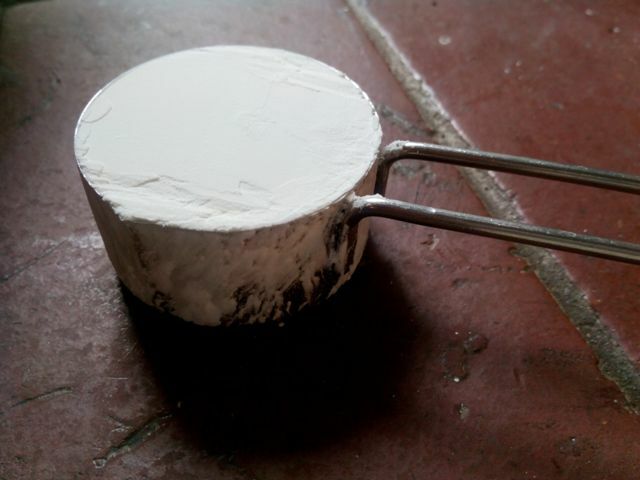 Here is a very simple recipe for a great glue for most paper based projects. It is extremely easy to make, cost effective, completely edible and based on an abundant, minimally processed ingredient – cornstarch. 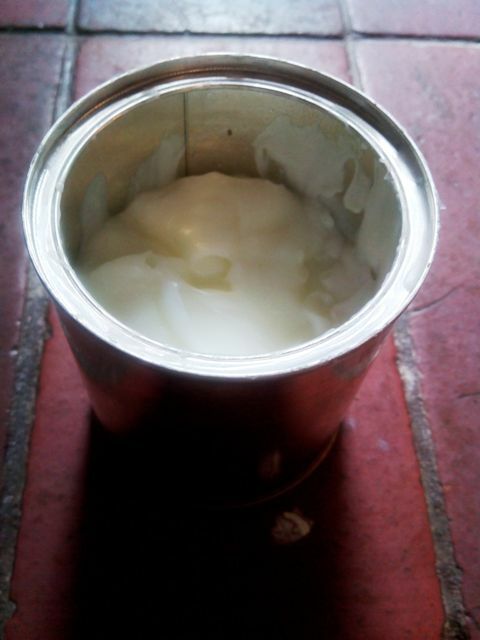 There are several other homemade glue recipes available, but I chose this one for its extreme simplicity. It works really well for most craft and school projects. I used a quarter cup of cornstarch here, mixed with 3/4 cup of water. 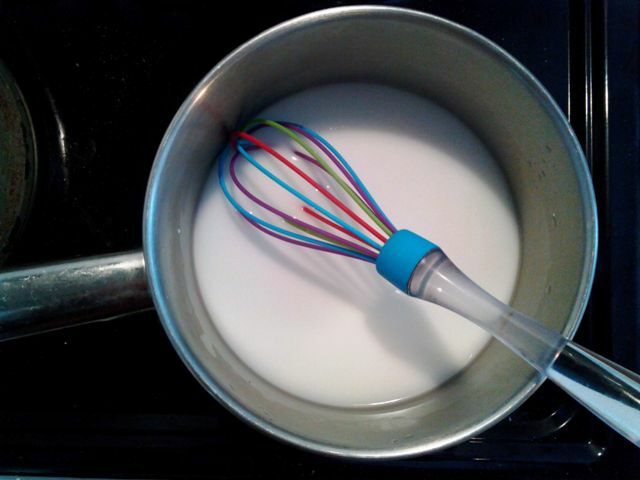 Slake the cornstarch by mixing it briskly with the cold water using a fork until it forms a white, watery mixture with no lumps (as in the first picture below). Heat the mixture over a low to medium heat, stirring constantly. 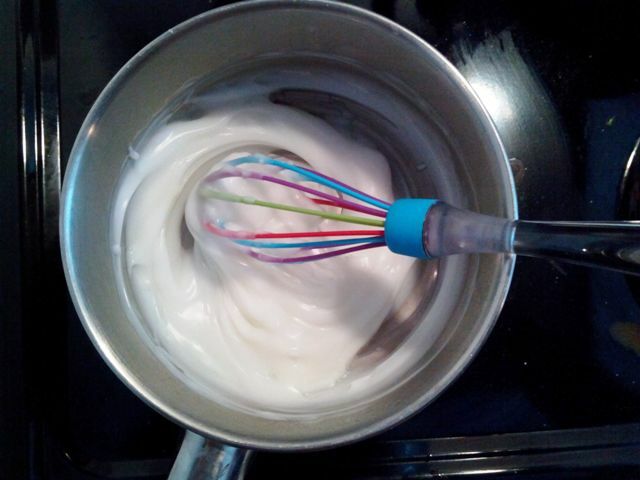 Remove from the heat when it thickens and congeals into a rich paste (as in the second picture below). The change is quite sudden and obvious. Apply the glue with a flat sucker stick, butter knife or your finger. How beautifully simple is that? You can make a more watery version for papier mache, resist batique, or decoupage. I find it works better than flour and water mixtures. And how lovely to let the kids stick and play and smear and lick and create, knowing it is totally safe and edible!